removal would be another triumph for the winners of 1939. And a terrible offense for anti-fascists who fought and gave their lives in that battle initiated by Picelli, Cieri and the Arditti of Parma in 1922 which ended victoriously in 1945.
supporters of the brigades have written to the British ambassador in Madrid, Giles Paxman, to ask him to intervene. “Although the court’s decision was taken on technical grounds, the original complaint was lodged by a lawyer with known far-right connections,” said Jim Jump, secretary of the London-based International Brigade Memorial Trust. 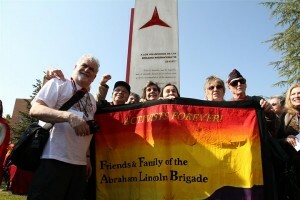 Friends & Family of the Abraham Lincoln Brigade (FFALB) has moved into action to prevent the removal of the monument (see our photo above at the dedication in Madrid). We have sent a protest to the Spanish Ambassador to the U.N. asking for a meeting as soon as possible. We welcome others to join us on that day. Contact us at ffalb2013@gmail.com. I join in the protest against the clear return of Franquismo to Spain. All the best and Salud y Republica ! tel. + 61 3 5166 1502; fax + 61 3 5166 1888. I am applalled at the Spanish Courts decision to require the removal of The IB Monument. The IB Monument stands for the mena and women who came from around the world to give a new democracy a chance at surviving and living and a better way of life for Spains citizens. You wish to return to the days of Franco? You the Spanish courts have failed the Spanish people, Spains history, and yourselves for lacking the courage to stand up for freedom. Viva the Brigadistas! Can you imagine a Adolf Hitler Foundation in Germany? In Spain we have the National Foundation Francisco Franco and that’s is legal!!! They interviewed the guy that sued the University for erecting the monument. “I encourage anyone with knowledge of any attempt to demolish a monument linked to the Nationalist side, or install the claim of some monument or glorifying street to the “Red side”, to review “very closely” the procedure administrative being followed in both cases.